Some years (indeed many years) before I was born, Harold MacMillan, the prime minister of Britain made a speech telling the people that they'd never had it so good. Well, that's politics, this site is about the weather. In Phuket. Not Britain. Still bloody freezing over there back 'ome I guess. Here it's picture perfect, 30 something degrees, sun, sun and more sun... We've never had it so good! It means there's not much to say on a weather blog. Not seen any rain for the last few days. The easterly winds have calmed, so boat rides are less bouncy, the days are hot, but the nights are quite fresh with clear skies. It was full moon a couple of days ago, the 21st - this was a Buddhist Holiday called Makha Bucha Day. Today, my sacred day off work... We have had a relaxing day. 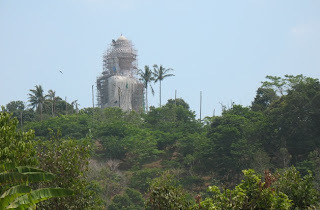 Went up Buddha Mountain where the 45m high Big Buddha is slowly nearing completion. 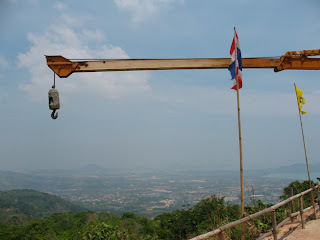 We have been going up that mountain for years watching the building progress. I reckon it might be all done in another year.. or two..